Oxford University Press, USA, 9780190604981, 368pp. Misogyny is a hot topic, yet it's often misunderstood. What is misogyny, exactly? Who deserves to be called a misogynist? How does misogyny contrast with sexism, and why is it prone to persist - or increase - even when sexist gender roles are waning? This book is an exploration of misogyny in public life and politics by the moral philosopher and writer Kate Manne. It argues that misogyny should not be understood primarily in terms of the hatred or hostility some men feel toward all or most women. Rather, it's primarily about controlling, policing, punishing, and exiling the "bad" women who challenge male dominance. And it's compatible with rewarding "the good ones," and singling out other women to serve as warnings to those who are out of order. It's also common for women to serve as scapegoats, be burned as witches, and treated as pariahs. Kate Manne is an assistant professor of philosophy at Cornell University, having previously been a junior fellow at the Harvard Society of Fellows from 2011-2013. She works in moral, social, and feminist philosophy. In addition to academic journals, her work has appeared in The New York Times, The Times Literary Supplement, The Chronicle of Higher Education, The Huffington Post, , The New Philosopher, and Boston Review. 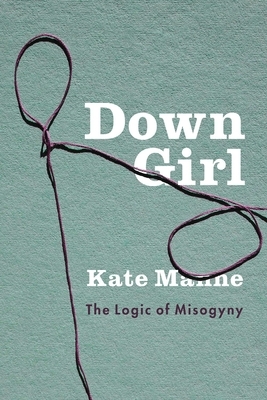 Her book Down Girl: The Logic of Misogyny was awarded the 2019 PROSE Award for Excellence in the Humanities by the Association of American Publishers.